green tahini dressing on falafel salad | eating with S.O.L.E. Adjust to taste / texture, if you want it thicker add more tahini, if you are after salad dressing add a little more acid and oil. Anyway your off to a great green start with this major flavour booster! The day after falafel night I used all the extra garden fresh garnish; lettuce, kale, radish, shredded beets, pickled carrots, sesame seeds, a little leftover garlic lemon rice and a couple falafels to make the most lovely salad complete with a dollop of this green tahini dressing! 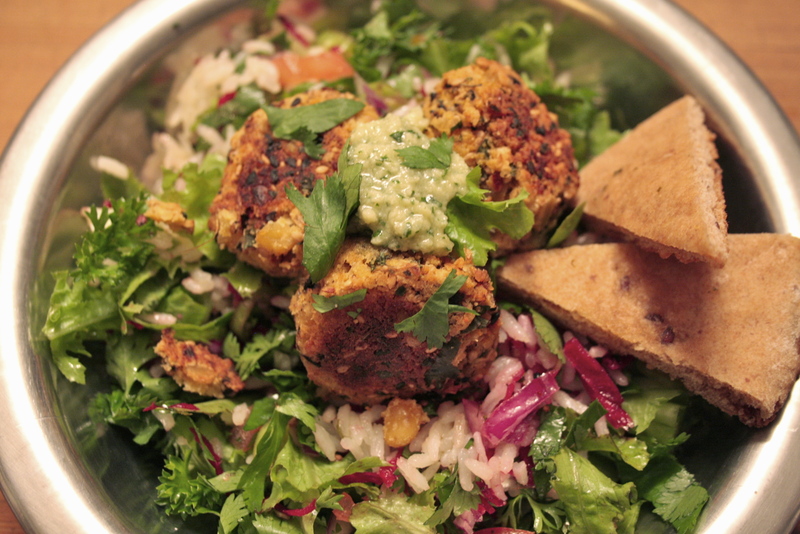 Falafel night will never be without tahini again! I might even just serve this dressing over rice or as a dip it was that good! SHAUNA! Do you know how much money you could be making if you published all your fantastic recipes in a Cookbook? Think of the success of the WhiteWater cookbooks. Your recipes are every bit as good, if not better and so suited to this Valley. I do love that you so freely share these fantastic recipes, believe me, but gosh, Girl, had you thought of this novel idea? Hugs, Claire p.s. I loved the Pow cookies, and can’t wait to make that Sweet Potato pie, oh yeah!